Achieving a radiant smile has never been more important, and having beautiful white teeth is one of the best ways to boost your self-confidence. If you are considering teeth whitening, you will probably be interested to know what it involves and how it works. Here, you can find out everything that you need to know. The most common method of tooth whitening is professional bleaching. While this treatment is not suitable for everyone, it is a very effective way of improving the appearance of your smile and is carried out by a qualified dentist in their surgery. 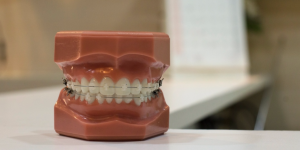 This is a simple procedure which involves protecting the gums with a gel or rubber shield and then applying a whitening product to the teeth via a custom made tray like a mouth guard which fits around the teeth. There is an active ingredient in the whitening product (usually carbamide peroxide or hydrogen peroxide) and when this is broken down it allows oxygen to get into the tooth enamel, lightening its colour. Professional tooth bleaching is carried out over 3 to 4 weeks. Initially, you will need to visit your dentist a couple of times in order for impressions for the mouth guard to be taken and then a subsequent visit to apply the whitening product. Once the treatment has been started, you can continue receiving treatment at home by applying the product to your teeth yourself for the next 2 to 4 weeks for between 30 minutes and an hour per session. Some newer products may be left on the teeth for up to 8 hours per session and these produce excellent results within just a week. While professional bleaching is one of the most popular forms of tooth whitening, there are some other options available. Power whitening involves painting a bleaching product onto the teeth and then activating the chemicals in it with a light to produce a fast and effective result. You could also opt for a home whitening kit however these are not always as effective as a professional treatment. Do The Results Of Teeth Whitening Last? Tooth whitening usually lasts around 3 years however if you smoke, drink coffee or eat any other product that may stain your teeth you will find that the results last a shorter time.